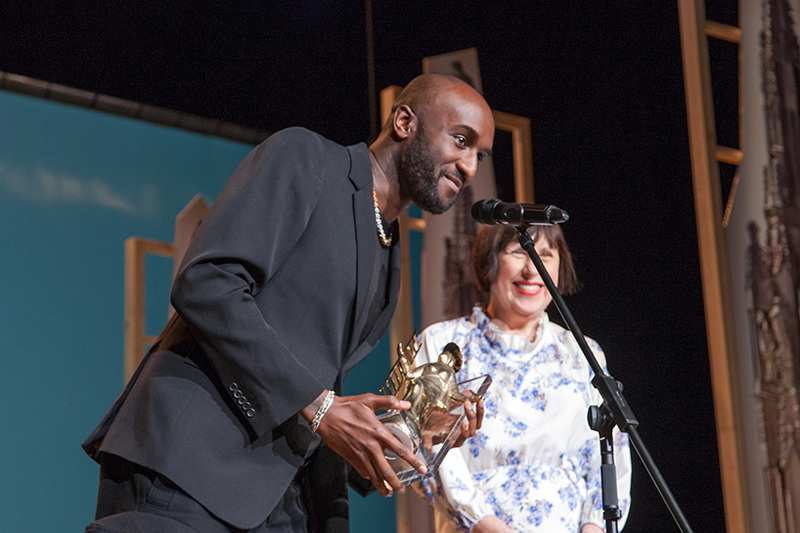 award statuette and trophy design recognizes excellence in all areas of creative enterprise. 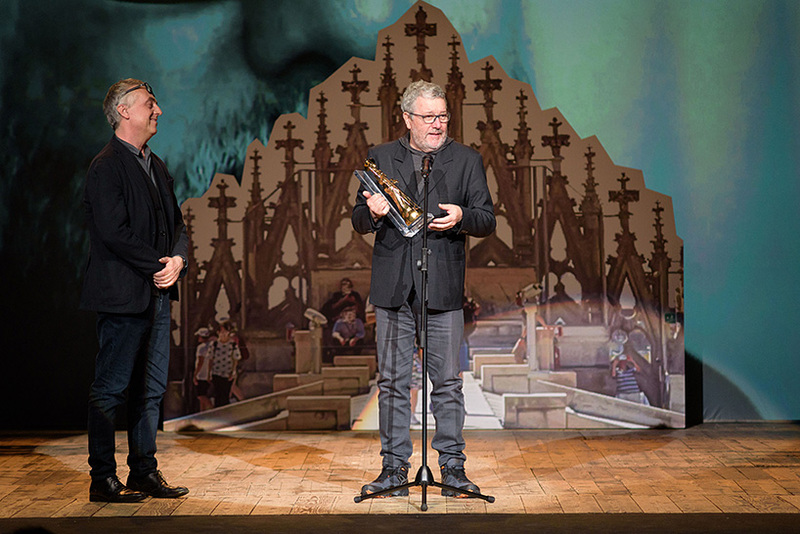 the design of trophies and awards aims to combine a timeless monolith, a primary form with imaginative form-giving. 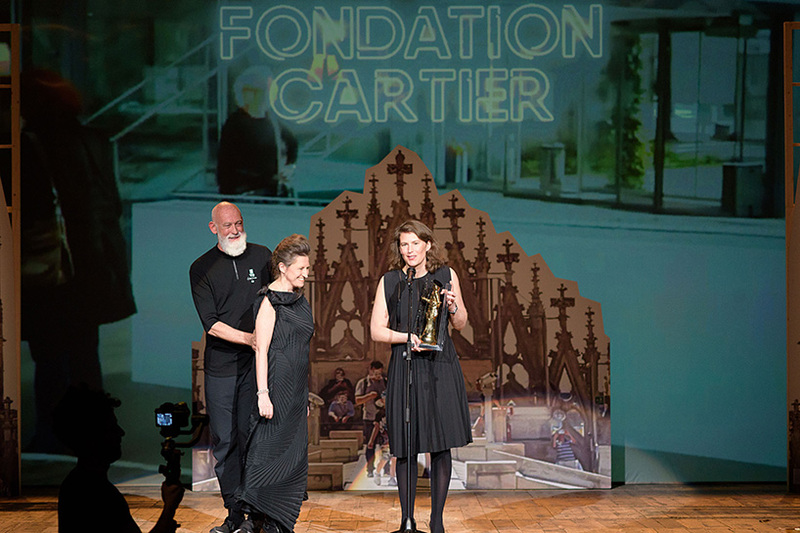 international awards programs increasingly ask leading architects and designers to create them. 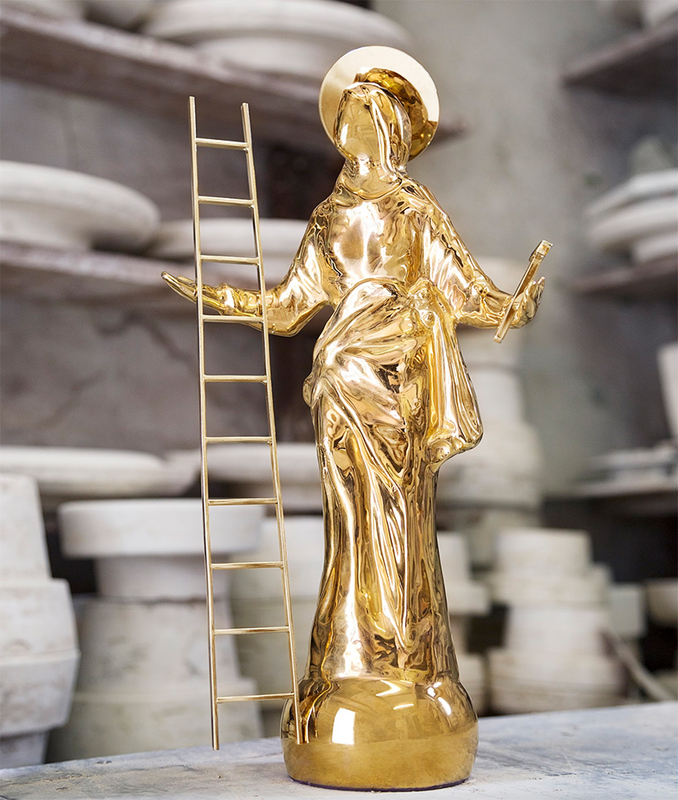 philippe starck, virgil abloh, and tomás saraceno were among the radiant roster of creative luminaries to receive a golden madonnina statuette on ‘the roof of the duomo’, celebrating the third edition of THE DESIGN PRIZE. 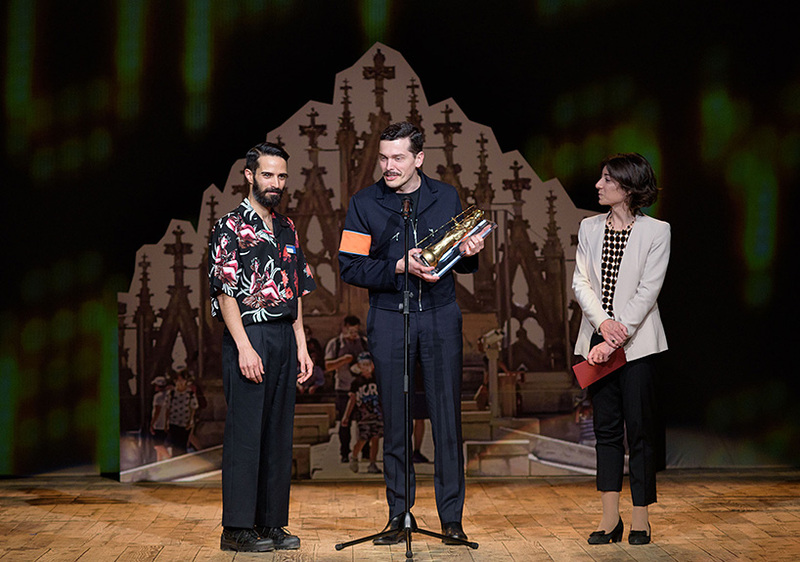 milan’s official award program kicked off design week with a star studded gala ceremony at triennale milano, where THE DESIGN PRIZE celebrated the extraordinary achievements, and little sparks of beauty and delight that emerged over the past 12 months. 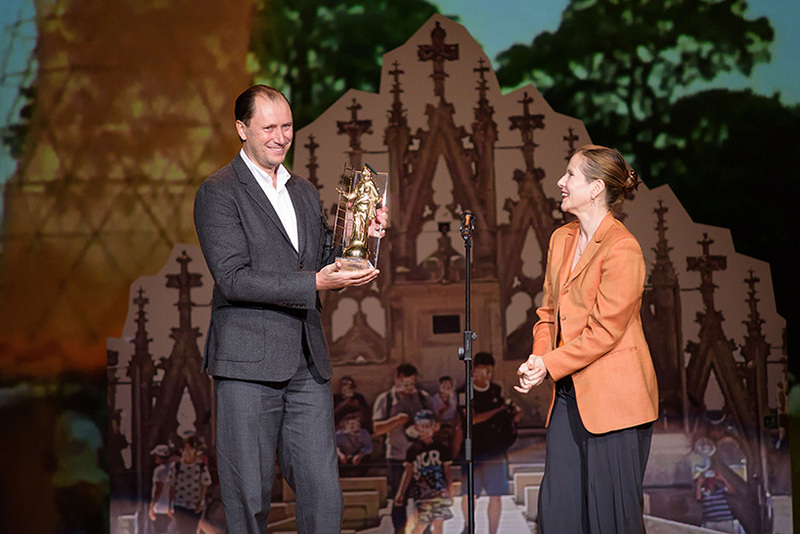 10 winners, and the recipient of the social impact public vote, were presented with a (golden) madonnina statuette — the renowned trophy designed by antonio aricò. 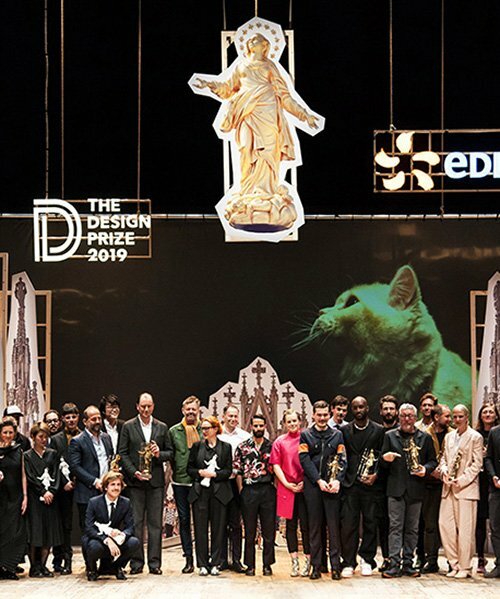 THE DESIGN PRIZE 2019 winners take to the stage! 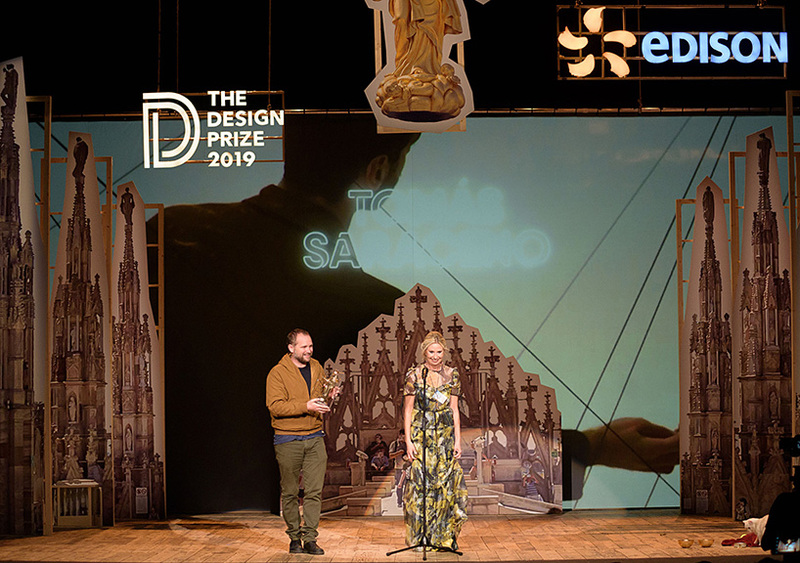 for THE DESIGN PRIZE 2019, the scenography of triennale milano’s teatro dell’arte has been designed to bring guests to ‘the roof of the duomo’, upon which the golden madonnina proudly presides. 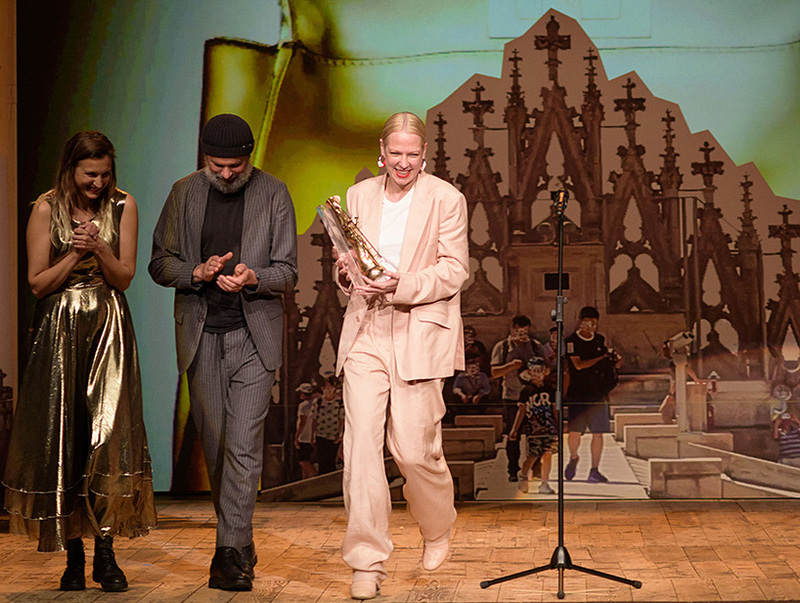 elements of the milanese architectural jewel were ‘rebuilt’ on stage, and winners received their statuette beneath a cut-out of the madonnina herself. the presenters of the ceremony this year? two curious cats — just like those that roamed the rooftops of milanese houses. 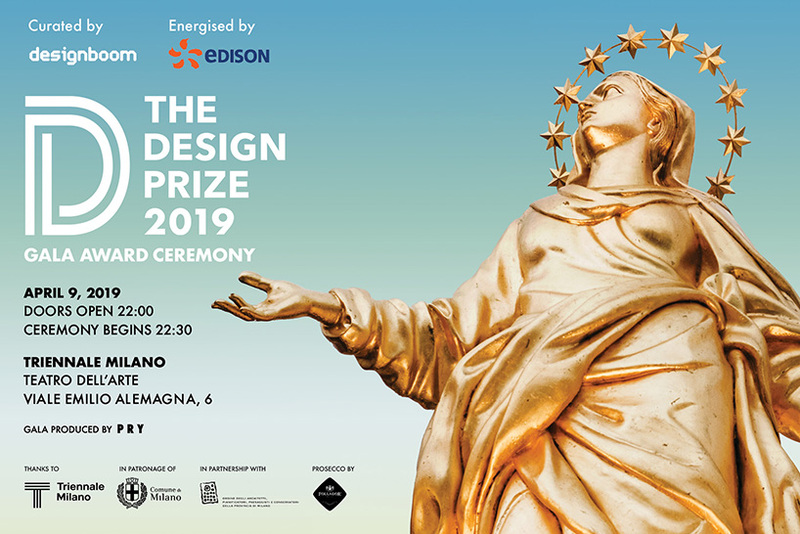 under the patronage of the municipality of milan, THE DESIGN PRIZE is curated by designboom, energized by EDISON, and presented in partnership with the order of architects, with the gala award ceremony produced by PRY. during the walk-in and afterparty in the triennale milano garden, guests were treated to prosecco by follador, italian producer of sparkling wines with a deep-rooted family history, and earnest passion for contemporary culture. 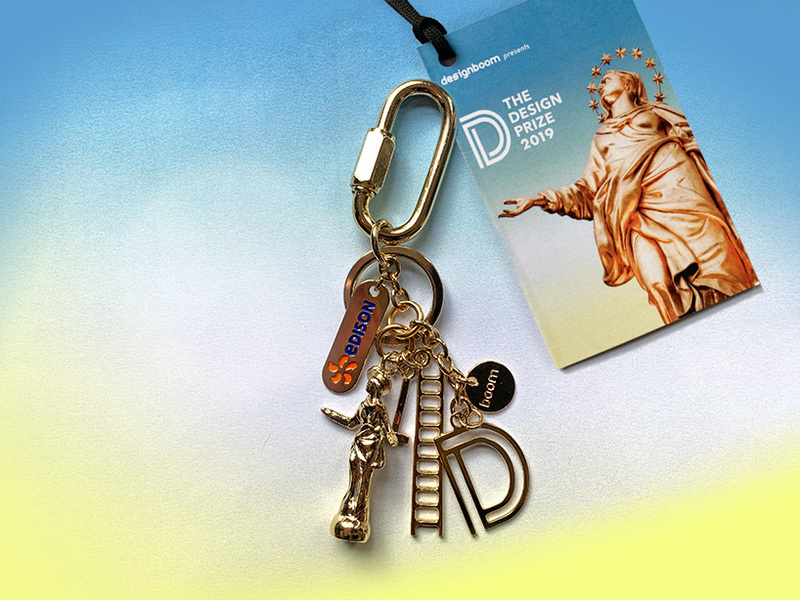 bag candy bling / tchotchkes keychains – all guests were gifted THE DESIGN PRIZE golden charms and mini program. with a sense of humor, one of the fashion industry’s hottest trends is making a strong comeback. designed by designboom in collaboration with antonio arico. philippe starck, world famous creator with multifaceted inventiveness, is always focused on the essential, his vision: that creation, whatever form it takes, must improve the lives of as many people as possible. this philosophy has made him one of the pioneers and central figures of the concept of ‘democratic design’. during the period of radical and experimental architecture, michele de lucchi was a prominent figure in movements like cavart, alchymia and memphis. de lucchi has designed furniture for the most known italian and european companies; work and corporate identity spaces; and architectural projects in italy and abroad, including residential, industrial and cultural buildings and corporate headquarters. jasper morrison’s work is wide ranging, from tableware and kitchen products to furniture and lighting, sanitary-ware, electronics and appliance design. clients are worldwide, united as leaders in their individual fields, but in other respects extremely diverse. abloh is the artistic director of louis vuitton’s menswear collection since march 2018, and also serves as the chief executive officer of the milan-based label off-white, a fashion house he founded in 2013. in 2018, TIME magazine named him one of the 100 most influential people in the world because of the foundation of his values that are ‘humanity itself, not a superficial trick’. his guiding principle reveals ‘everything in quotes’. the spring summer 2018 campaign features imagery from classic artworks, with characters dressed in the collection’s designs by alessandro michele, creative director of gucci . digital painting by spanish artist ignasi monreal take us on a journey through the three elements — earth, sea and sky — and ironic portraits with pop culture references. during milan design week 2018, Hermès presented a new home collection within seven architectural structures conceived by charlotte macaux perelman, co-artistic director of Hermès maison together with alexis fabry. meanwhile, Hermès ginza — housed within a glass block building by renzo piano — was transformed into an interactive projection mapping video game. michael anastassiades explores contemporary notions of culture and aesthetics through a combination of product, furniture and environmental design. positioned between fine art and design, his work aims to provoke dialogue, participation and interaction. he creates objects that are minimal, utilitarian and almost mundane, yet full of vitality one might not expect. nendo is the studio of japanese designer oki sato whose multifarious activities in the design work span from graphic and product design, to furniture, installations, windows, interiors, and architecture. patricia urquiola is a spanish-born designer based in milan, italy. she worked as the head of product development at de padova, as well as head of lissoni associati’s design group, before opening her own studio in 2001. since then, she has collaborated with a numerous companies. in 2015, she was appointed art director of cassina. ‘on air’ proposes a space and time that reveals the strength of the presences floating in the air and the way they interact with us: from CO2 to cosmic dust, from radio infrastructures to reimagined corridors of mobility. thus, the invisible histories that compose the nature we are part of invite us to rethink poetically new ways to inhabit the world – and of being human. tomás saraceno’s exhibition celebrates new ways of thinking about our relation with the planet, through new modes of knowledge production. teamlab has created a complex, highly interactive and engaging multi-sensory experience within the museum — the first of its kind. it isn’t called ‘borderless’ for nothing, the art moves freely. in just a few minutes, you can experience a change of scenery, even while standing in the same spot. ‘etherea’ by edoardo tresoldi follows a growing experiential path where architecture becomes a tool and place for contemplation. the artwork consists of three transparent sculptures inspired by neoclassical and baroque architecture, made of transparent wire mesh. the exhibition, the first of this scale devoted to junya ishigami, allowed visitors to discover or rediscover his delicate, dreamlike universe through a series of large-scale models, films and drawings, documenting the different stages of his creative process. V&A dundee is scotland’s first design museum and the first victoria and albert museum outside london. a conjoined pair of inverted pyramids in rugged concrete, terraced into artificial hills and partly built on the water, by architect kengo kuma. interiors include the oak room, a 1907 project by charles rennie mackintosh. vitra exhibits showed space-age structures of mero steel tubes, projected films, and pink neon signs and blue incandescent bulbs by exhibition designer konstantin grcic and lighting designer matthias singer. warka water by arturo vittori is a solution to prevent the loss of drinking water in ethiopia, haiti, togo and cameroon: to test the air as a potential water source, a kit has been designed that connects to the warka tower, where water is collected. 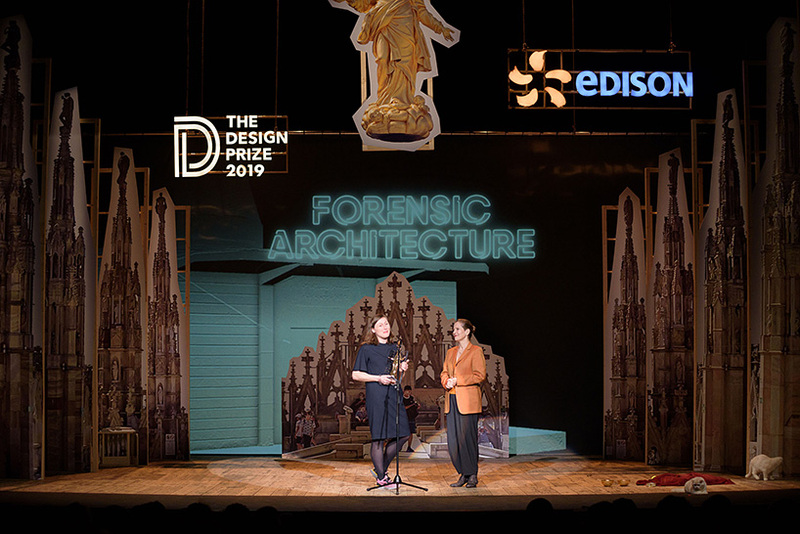 forensic architecture is a research group linked to the goldsmiths university of london, which intends to use investigative technology to identify cases of human rights violations, in collaboration with international tribunals, human rights organizations and environmental justice groups. ocean cleanup comprises the conception of the first system to clean the oceans and that could accelerate the process, since the technology on which it is based exploits the currents of the sea. andrea trimarchi and simone farresin have established a coherent body of work that is characterized by experimental material investigations. their most recent works, ‘ore streams’, reflects on the recycling of electronic waste, material which is increasing in both quantity and value. the designer’s practice is based on permanent experimentation with wood, stone, expanded polystyrene, and polyurethane rubber, and has been shown in many gallery exhibitions, among them gallery fumi and salon 94 design. the british-born, hong kong-based designer is one of the leading international figures continuing to push the boundaries of experimental design. the passion for pioneering technology brought him to explore the endless possibilities that asia’s technological ingenuity may provide. manifesta is the european nomadic biennial, held in a different host city every two years. it is a major international art event, attracting visitors from all over the world. 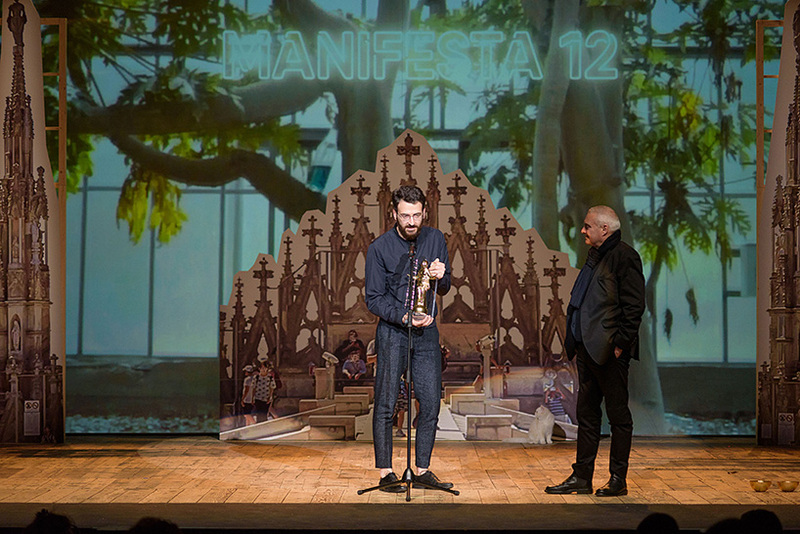 manifesta is the go-to place for discovering emerging artists, thought-provoking ideas, new artworks especially commissioned for the event, and creative experiences in dialogue with spectacular locations of each host city. the interdisciplinary platform for social change is introducing holistic urban research and legacy-oriented programming. the 2018 work marathon curated by obrist explored issues including technological developments enabling automation; its impact on labour and work; the political urgencies of coerced and invisible labour; the differentiation between labour, employment and work; and the role of non-human agents, including artificial intelligence, non-human animals and materials, in the context of planetary-scale ecologies. curated by maria cristina didero, ‘fun house’ — snarkitecture’s first comprehensive museum exhibition — showed a structure that recalls and re-imagines the idea of the traditional home and a sequence of interactive rooms; ‘vegan design’ by israeli artist erez nevi pana is aiming to introduce veganism to the design industry by experimenting with different plants and minerals to create animal-free furniture. sabine marcelis poetically manipulates light, whose properties are enhanced through the inventive use of neon lamps, reflective surfaces and colored translucencies. her work ranges from creating candy-coloured cubed displays for fashion houses, to transforming a circular building into a large-scale timepiece for a watch brand. israel’s sun-consumed desert prompted the designer’s analysis of the potential of salt and centred on a special crystallisation process. the versatile substance is suited to durable furnishing production and multiple architectural declinations. the new york-based artist combines fashion, art, architecture and retail to create multi-sensory experiences. known for creating basketball hoops that float in the ocean, margaritis recently collaborated with venetian brand golden goose deluxe during 2018’s venice architecture biennale. 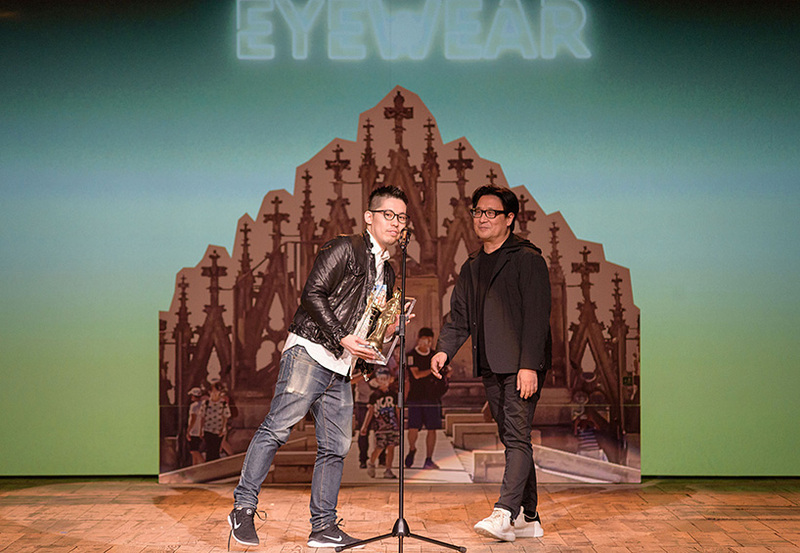 the JINS design project encompasses collaborations with renowned designers — konstantin grcic, jasper morrison, naoto fukasawa, michele de lucchi, …– to design JINS high quality eyewear on an industrial scale and the brands retail outlets. junya ishigami has installed 12-meter-long (39-feet) cantilevered concrete display shelves in his shanghai store design. the minimal interior is painted white, with its industrial setting accentuated by exposed piping and ventilation in the ceiling. milan’s apple piazza liberty is defined by a dramatic waterfall forming the backdrop to a large outdoor amphitheater. inside the glass cube, customers travel beneath the public piazza into the new electronics store. NOMAD 2018 was presented at the heart of the swiss alps, in st moritz, inviting collectors, interior designers, architects and the art world’s glitterati. the showcase mixes high-end modern and contemporary art and design, redefining the classic idea of events and fair exhibitions by placing works in incredible architectural locations. 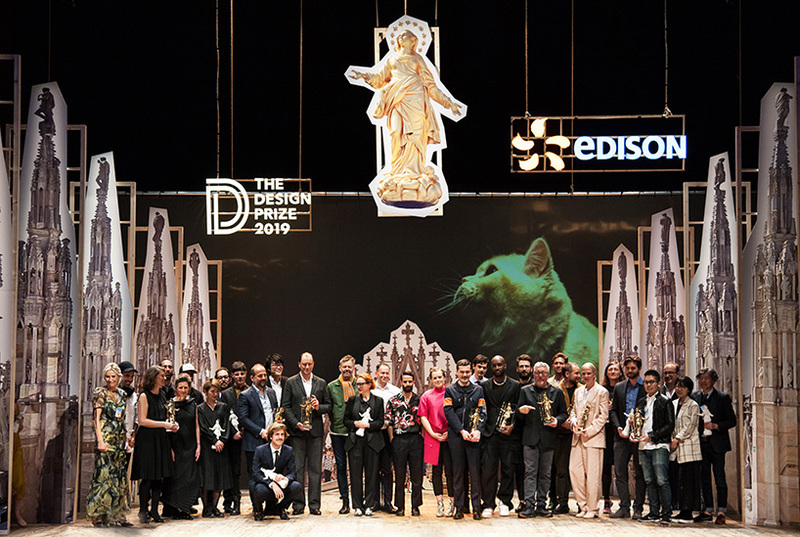 edison, one of the largest energy companies in italy, has been a partner and promoter of the initiative since its inception in 2017. this year, edison continues its collaboration with THE DESIGN PRIZE, the international award dedicated to project culture, which is also a virtuous expression of co-planning based on the efficient use of resources for the construction of a sustainable future. 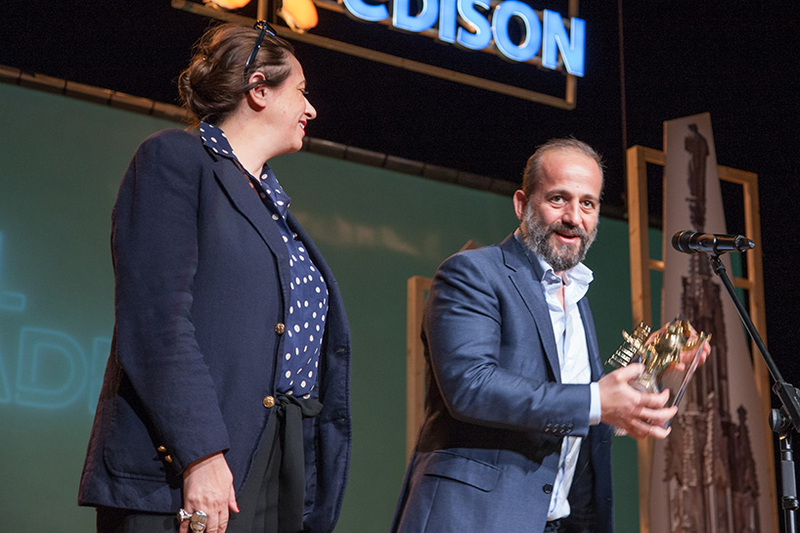 edison brings its unique experience, know-how, and 130-year-long history in the energy sector to the design prize, helping foster a horizontal approach to design. together with the leading professionals and architects, edison proposes intelligent solutions for cities and people in favor of a more evolved and sustainable lifestyle.